The subscription monetization model is not a new thing to the app economy. However, it is only during the recent years that it has gained traction and penetrated to more app categories. Apps like Netflix, Spotify and Dropbox use what is called software-as-a-service (SaaS) technique by offering monthly or annual subscriptions. Due to its viability as a forward-thinking revenue model, both Apple and Google found it indispensable to rethink their subscription guidelines which brought about the recent changes in their policies. Primarily, the subscription model is different from the usual way of monetizing apps. Instead of paying upfront for an app or buying in-app items as the need arises, customers are billed for a fraction of the amount they would normally shell out but on a recurring basis. Users get the promised content while their subscription lasts. Once a subscription is cancelled, customers can still use the app but the premium content and privileges that goes with it will be blocked. Companies that have switched to this business model are enjoying noticeable growths. It has been reflected in the recent top charts of the app stores. Several apps listed in the top grossing category use subscriptions as their main monetization strategy. So, why should you try the subscription model? Here are some solid reasons to help discerning developers get a clearer understanding and see whether this model is a fit for their apps. Recurring revenue is one of the biggest draws for developers wanting to embrace the subscription economy. Normally, mobile app pricing evolves from three typical models: freemium, paid or premium and subscription. For a long time, freemium has been the predominant model among the three schemes; though it is still doing well up to this day but mostly only for mobile games. However, things are changing as developers begin to recognize the real benefits of offering subscriptions. Subscriptions typically have an auto-renew feature which allows for a steady flow of income from your app. It gives you the ability to predict future earnings and to forecast continued growth which is a valuable tool especially in the midst of the financial unpredictability of the app business. By billing users on a recurring basis, you can increase your Average Revenue Per User (ARPU). It allows app companies to see the profitability of the business from a different perspective. However, you need to retain those customers for a period of time in order for this tool to be effective. Additionally, a subscription-based pricing scheme often presents itself as the most affordable choice which can also give your app a boost over the competition. The core strength of the subscription business model lies on a strong app and a solid user relationship. The benefits cut both ways. For developers, subscriptions encourages them to go the extra mile in maintaining good relationships with users. They say, one way to discourage loyalty is to deem your customers as a one-and-done sale with customer-business relationships ending after executing a one-off sale transaction. Embarking in a subscription-based business gives you a fair shot at cementing user relationship by implementing engagement plans and retention techniques that the one-off purchase model simply cannot provide. User engagement is a significant aspect that keep this relationship excellent. From a developer’s point of view, keeping the user engaged ensures a bright future of repeat transactions. Aside from that, you can also use engagement to gauge the value of your content. If user engagement rate is rising, you can say that you are giving them good value to stay in your business. In addition, one critical aspect in keeping users engaged is being sure to provide fresh releases and latest app features on a regular basis. Giving new content and bringing more value to their experience will lure them to stay subscribed over the long haul. And, the fast deployment system that the app stores now offer is a big factor that enables developers to release new app functionalities quickly and efficiently. Rethinking your retention strategy is also essential in order to sustain a strong alliance between your app and its users. It will help you achieve the revenue objectives you intended for your subscription business. This is more critical for developers with apps in the iOS platform since you need to keep users longer than 12 months in order to get a more lucrative revenue share from Apple. There are various ways to implement a retention plan but how well you manage and execute them will be a significant influence that will be put to the test every time the renewal period comes around. Remember, with subscriptions, you are in the customer service business. Aside from valuable content, a strong customer support team is also a non-negotiable part of it. The continuous stream of earnings will ensure a well funded dedicated customer support squad that will make certain that users are satisfied and subscribed. Apple took a big leap in promoting subscriptions by increasing the revenue split in favor of the developers. The traditional 30/70 split between Apple and app developers is now going to be 15/85 after keeping a subscriber for one year. This means that the traditional split still applies for the first year that the customer is subscribed to your app. After that, the new 15/85 scheme will be implemented which means, you will get bigger revenue opportunity. Apple knows how to give rewards but developers need to do their part in keeping the users engaged. Google followed suit and made the deal even sweeter by giving the 15/85 revenue split even on the first year of subscription. Android developers don’t need to wait for a year to enjoy this lucrative offer. Even though the 15% cut from Apple and Google is still relatively big, the brand new boost in revenue share can be a great incentive to make app developers strive to grow their user subscription base and keep them for the long term. With subscribers bringing in monthly recurring revenues – that makes them an indispensable asset to your business. They give you a guarantee of repeat transactions. That’s why even though the subscription price is typically smaller than a one-time payment, it provides the assurance of future transactions by incentivizing users into committing to longer billing cycles. When subscription revenues rise, the value of your app and your app business rises. This is due to the fact that revenue from subscriptions is closely tied to general business performance. In comparison, the revenue generated from a single purchase is directly tied to your sales effort and does not necessarily reflect the overall performance of your app. Furthermore, the increased value of your app becomes very helpful if you want to acquire a loan to hike up the funding for your growing business. And, if for some reasons you want to sell your app, you can usually secure a larger sale price if you are running a subscription-based strategy. This is mainly because, you are not only selling the license to your app but also the subscription base that goes with it. The higher recurring revenue you can guarantee to show a prospective buyer, the higher the valuation is going to be. The app industry has grown so big that the need for decluttering the app stores is more prevalent than ever. Since competition is being taken to its limits, it has made making money very difficult if not impossible for the smaller, independent developers. Subscriptions can play a big role in making the app store economy vibrant and sustainable again. High-quality and unique apps will be recognized and will be kept alive and well. However, apps with inferior quality and copycats rendering out-of-date features will be purged from the stores. Subscription based apps should stand a much better chance of not being removed. With subscriptions, app makers need to step up their game in order to ride this new wave to success. You might be one of those who have been relying on the strong growth of iPhone sales to secure your future earnings. But we know that the growth of both iPhone and smartphone sales in general have not been as strong in recent years and might be nearing their saturation points. That is why Apple and Google are finding ways to turn users from being one-off buyers into loyal subscribers. So, it might just be time to try your hand at doing a subscription based app. Producing top of the line and quality apps with feature-packed recurring content shouldn’t be looked at as just another option anymore. It is now easier than ever to switch to a subscription-based approach of monetization. 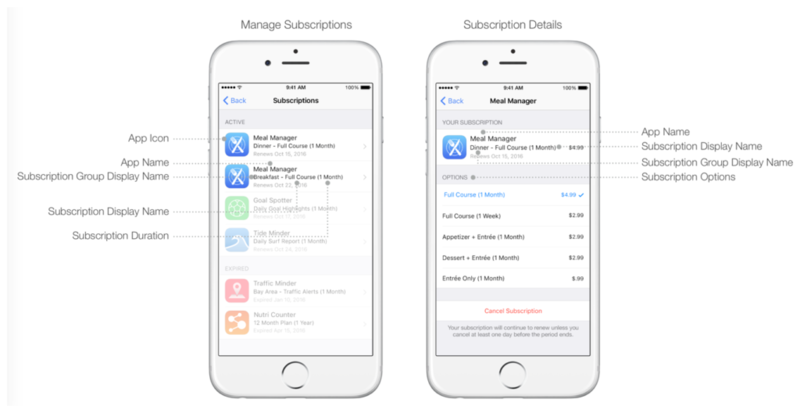 A lot of things have changed in the new subscription policy especially for iOS apps. You can now easily set up a territory-specific price in all app stores. This is very important if you want to sell your app to regions like the EU that implements regulations such as VAT MOSS. The new policy also allows developers to manipulate pricing to existing and new subscribers. For instance, you can keep the pricing for existing subscribers while increasing it a bit for the new subscribers. You also have the flexibility to adjust the price along with the service level. So, you can create different subscription groups with different levels of service and different pricing schemes such as basic, premium and pro. Similar to pricing flexibility widely used in web services subscriptions, you will now have the ability to offer discounts to yearly subscribers over your month-by-month users. Subscribers can also switch between subscription levels and groups conveniently and without compromising access to the app. Plus, they can do that without paying double fees. 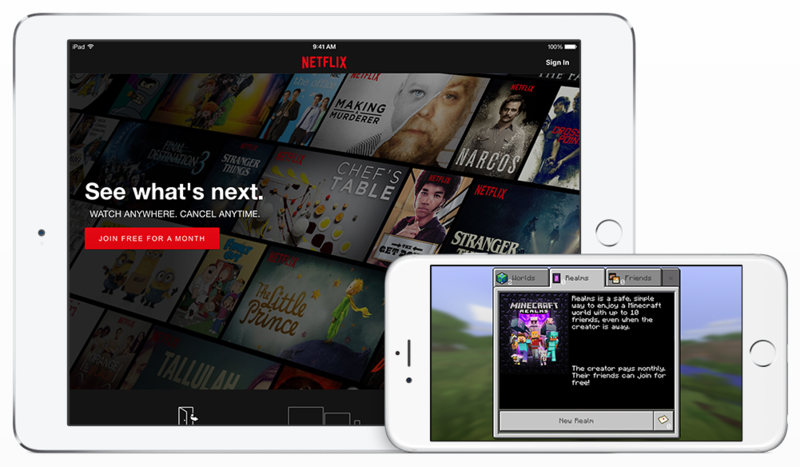 The new subscription model now allows a wider range of apps to adapt to the system. Google Play is far more liberal in its past implementation by allowing subscriptions to more than just magazine or newspaper, music or movies streaming services apps. In fact, Google allows selling of subscriptions to almost any type of content from any type of app or game. Apple was stricter in this and only recently did adjust the policy to accept more app categories. This means that iOS developers can now have any of their apps converted to subscription-based models as long as they “make sense” for Apple. Stricter review guidelines for apps developed or redesigned for this type of business model will be implemented. So, it is not a question about which apps will be allowed to use this framework, instead, it is about which apps will be approved. There are a lot of scenarios where apps can be converted from being a one-off purchase to an auto-renewing subscription. Those apps that need a lot of maintenance and require a host of new features released regularly are a good fit for this model. For instance, productivity apps that charge quite a hefty amount for one-time purchase could turn to subscriptions. This will make their future updates premium instead of being free or having to launch a separate app for major version changes. Aside from the fact that they get to maximize their earning potentials, developers can also avoid confusing users from having separate versions of their app since new versions require new set of SKUs in the app store. In order to embrace the subscription economy, developers need to reshape their business models to focus on providing a steady stream of updates and new features. Most of them are being stuck in the build-launch-profit-forget formula that clearly did not work for many. However, these newly minted policies do not guarantee that you should immediately convert your app over or start building a brand new app that is right for subscriptions. The main key in deciding whether your app is ready for a subscription model or not is to thoroughly evaluate the value it gives. It is easy to validate this but you must keep in mind that the app itself is not the product but the value it provides that makes the difference. The ability to give out trial periods is one of the top strengths subscription-based app business model possesses. It allows users to test drive an app and give it a spin with first-hand experience for free. These free trials are a perfect chance to showcase what your app has to offer and take a shot to get users hooked to it. Several apps have proven this to be effective after launching a 7-day trial period. On the 8th day after release, some apps climbed the top charts and stayed there. Discover the impact of free trials and use it as a launching pad that can take your app to a new level. Are you ready to launch your very own subscription app? Or perhaps you wanted to convert your existing app to utilize the subscription monetization model? Well, you are on the right track for forward thinking. We’ve learned that subscriptions will be an important force in the future of the app business and in the consumption of technology in general. Small and indie developers can get a fair shot at success with subscriptions. Content value matters most in this business model so your creativity is the only real limit. It is not simply a process of turning a one-off payment scheme into a recurring fee without delivering repeat value within the content and the experience. As more and more apps adapt to this strategy the app ecosystem will continue to mature.